Intrusion prevention technology is understandably focused on using network data to detect and to stop intrusions in progress. When (not if) intrusion prevention systems fail to prevent intrusions, can they provide any value to the management of an incident? 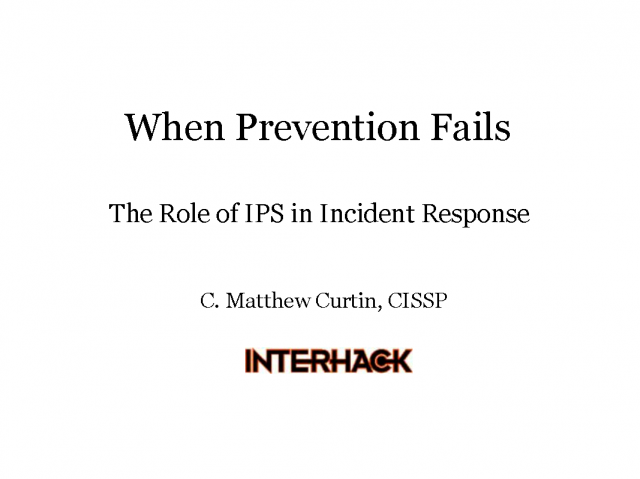 Using a case study of a security incident that took an international organization offline, we will look at the IPS technology in place, the role that it played in addressing the incident, and how the incident progressed when the IPS failed to achieve its expected objectives. Lessons learned will include consideration of how to use IPS technology can better be deployed, how available data may be used to assess fast-moving situations, and how IPS technology can fit into a larger program for identifying and responding to security incidents.